Log House Plants is a wholesale nursery specializing in edible and ornamental plants that thrive in the Pacific Northwest. Nestled on a sunny hillside at the southern tip of the Willamette Valley near Cottage Grove, Oregon, we work with growers all over the world to bring you an incredible, ever-evolving array of herbaceous plants. Our collections always include a full line of tasty and handsome herbs; vegetables galore, from treasured heirloom varieties to the newest All-America selections; tempting tropicals; and hundreds of varieties of uncommon annual and perennial flowers. We also create specialty collections, offered on a revolving basis – some of our favorites have been Butterfly Bed & Breakfast Host Plants, Shrubs for Cut Flowers, Grow to Know the World, and Confectionary Plants. Over the past forty years, Log House Plants has earned a reputation for excellence and innovation. Our goal is to support independent retail nurseries of the Pacific Northwest with a broad selection of unique and exciting varieties for gardeners, landscape architects, and plant collectors. 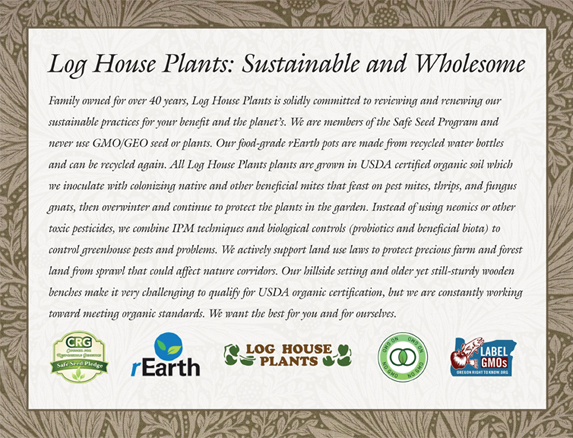 Log House Plants has a long standing commitment to sustainable gardening and to earth stewardship in and out of the garden. Click here for important information on helping honey bees. We also value the ecology of the work place and nurture a team based work model with an inclusive family atmosphere. In addition to growing plants, we’re dedicated to teaching about them – we want to share every bit of fascinating and useful information we have learned about each new discovery and old favorite. We’re excited to launch our redesigned website, with several new features to make it even more valuable as a reference tool for plant lovers of all levels, from novice gardeners to nursery staff and professional horticulturalists. As always, our Library pages provide all sorts of information on plant histories, cultural guidelines, special collections we’ve grown, even recipes! Also, our Variety Lists are all hyperlinked; just click on a plant name and you’ll be taken to a page featuring information and photos about that particular variety. Retailers, see our Current Availability (updated weekly from late January through September each year). For home gardeners, we have an extensive, updated list of garden centers and retail stores where you may find or order our plants. Ann Lovejoy writes a scintillating article every week on her blog, Green Gardening with Ann Lovejoy. Use Ann’s blog and our Garden News library, which highlights featured plants along with seasonal garden tips, design ideas, and planting information. Use of photos, text, logos or other images prohibited without prior written consent of Log House Plants. Most of our plant photos were created by Greg Lee, Robin Bachtler Cushman or Matt Emrich. Custom photography may be arranged with Matt Emrich Photography. Visit our friends and family at Aktaia Studios if you are looking for a quiet place to relax with a beautiful view next to the sea. Located on the south coast of Crete with a view of the Libyan sea. These newly built studios are equipped with kitchens (part of the room) , individual bathroom, shower and balconies.